This project was fun for so many different reasons! First, the client came to the project with loads of ideas of her own. It’s always fun helping clients weed through inspirational pics so that the end result doesn’t feel like Pinterest gone wrong, but rather feels more like a cohesive style carried from one room to the next. Secondly, I learned some mad shopping skills from this client! I thought I was good at finding a deal but I have nothing, absolutely nothing on this client! She knew what she needed in order to make her home livable for her family and knew that she needed to keep everything on-track with regards to the budget. I can remember sending her a bed I loved for the master suite…half an hour or so later she sent me a picture of an almost identical bed from another manufacturer for a lot less. 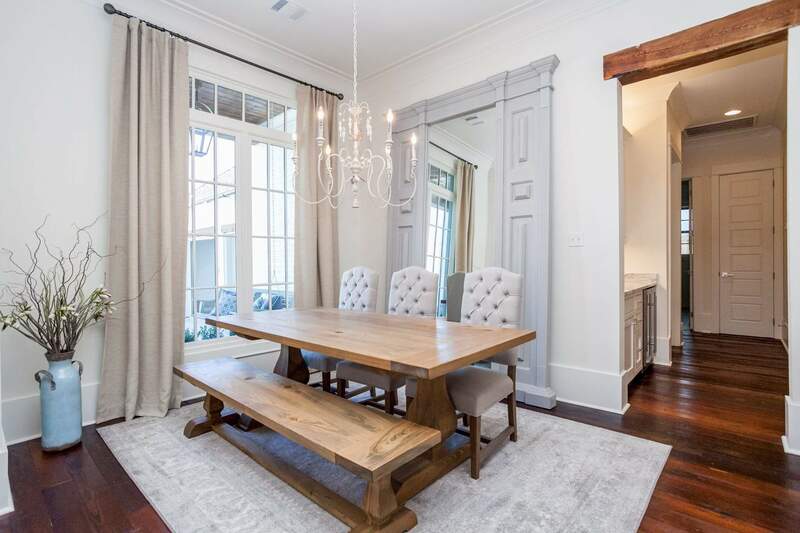 The mirror in this dining room picture is another testament to her saving abilities! I found this mirror in North Carolina but after getting shipping costs and such it was going to be a stretch to the budget. She found a local woodworker, gave him a picture of the mirror, and voila! here it is in all it’s glory at a steal of a price! 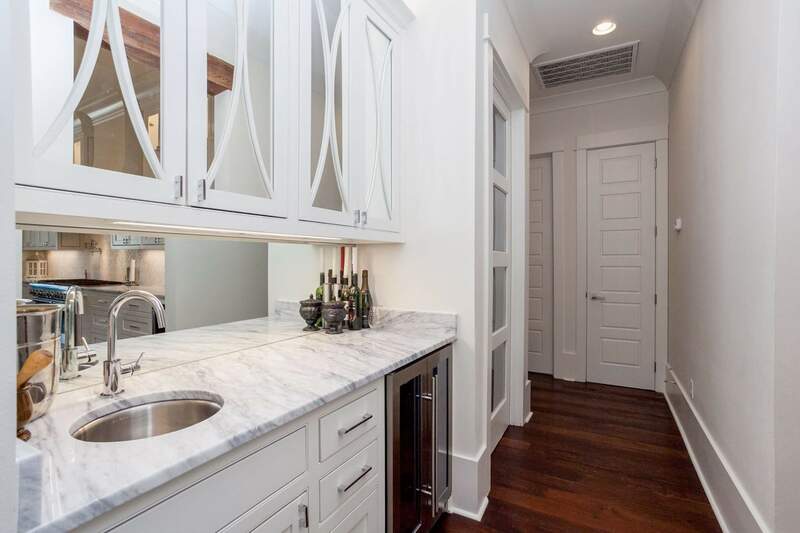 A great and usually inexpensive way to add touches of glam to a design is by incorporating mirrors. 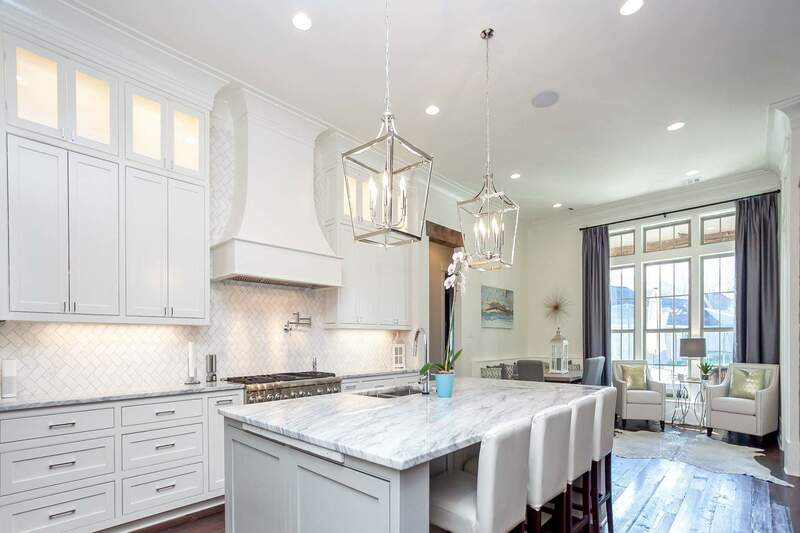 I especially love mirrored backsplashes as they give the illusion of deeper space while also reflecting more light into those under cabinet areas.